Social Innovation Leadership Sabbaticals, a 2017 LRNG Innovators Challenge grantee in Antioch, TN, provides the space and resources for students to pursue their wild ideas, revealing a desire to do work that connects and contributes to the local community and local environment. Something was wrong: the pumpkins were dying. Some sort of fungus had infected most of the field, and no one was sure what it was, let alone what to do about it. The man in charge, middle school teacher Jay Renfro, was as clueless as his students about how to proceed, but luckily this was no ordinary class assignment. The students, determined to save the pumpkins that they had put so much time, energy, and learning into growing all summer, sprung into action. Soon, one of them had identified the fungus and found a cost-effective, organic way to treat it: milk. A few days later, armed with several gallons of milk that the school cafeteria had been about to throw out, the students were back in the field, rescuing their crop. “I don’t know how they thought of that but it worked! It was awesome!” Renfro says. This pumpkin project was only the first in a series of interest-driven Social Innovation Leadership Sabbaticals, one of 10 projects across the country supported by a 2017 LRNG Innovators Challenge grant. The project, housed at Knowledge Academies in Antioch, TN, a community just south of Nashville, aims to give groups of students and teachers the time and support they need to pursue ideas and interests that might otherwise get lost in the broader curriculum, sparking the learning and connections that deep interest and ownership create. “During the normal school year you cover so many topics, but sometimes there’s one where it’s like, ‘we’re fired up about this.’ What if they could do something about it?” explains Renfro. Knowledge Academy students survey the grounds of a future city park. To this end, the Sabbaticals project aims to support ideas that connect to the Knowledge Academy’s “4 Cs:” college, community, creativity, and culture. “The kids, they’re entrepreneurs and they’re scientists and they’re innovators at heart, because kids are,” says Renfro, so these connections have emerged as students are given the time, resources, and support to pursue their passion projects. The pumpkin project, for instance, was the first such “sabbatical” and grew in part out of a group of students’ desire to grow fresh food for the community, much of which is occupied by food deserts. Half a year and three sabbaticals later, a clear theme has emerged: outdoor learning and connecting to the local environment. For example, since the successful conclusion of the pumpkin project, a different group of 7th and 8th graders spent three days at a research facility in the nearby Great Smoky Mountains, training as citizen scientists. Back from the mountains, the students are preparing to put this training to work in their community. Antioch, like much of the Nashville area, is currently seeing a lot of development without much input from the community. “What we don’t hear is a lot of people asking the questions like how does this impact the water, how does this impact the environment, how does this impact the things that make us like this place so much,” says Renfro. This focus on the outdoors is timely as well: a large new city park is going in about a mile from the school, and there’s a partnership in the works with the park’s administrator, whose office happens to share a parking lot with Knowledge Academy. The students hope to monitor the area, along with other spots in the community, performing tasks like bird counts, wildflower counts, and water quality monitoring. 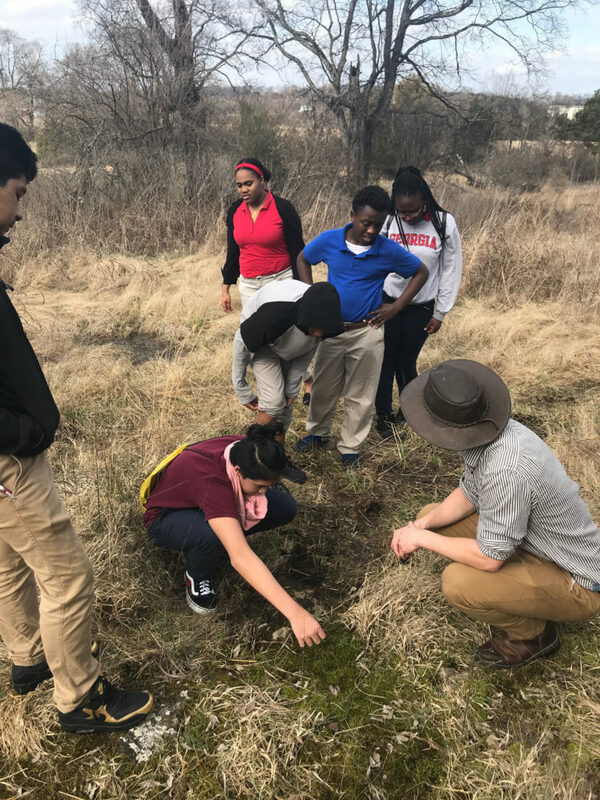 “The idea behind this citizen science project is that our students will be conducting these projects, and they’ll be gathering this data and they’ll present it to the community in an annual State of Antioch’s Environment,” Renfro explains. Currently in progress is a partnership with the Enactus Entrepreneurship Club at the nearby Belmont University, challenging teams of Knowledge Academy and Belmont students to pitch ways to use an old restaurant space on the school’s property. The aim is to support student-led social enterprise on campus, creating a passion-driven space for students to build entrepreneurship skills while thinking about how to address problems in their community. This all fits with a larger goal of the Sabbaticals project, which is to take these wild ideas and use them to launch sustainable, long-term programs that will outlive the money from the LRNG Innovators Challenge grant, reshaping the school’s offerings based on the passions of its students.